In July 1987, my wife Tammy and I first learned of the 1912 Villisca, Iowa Axe Murders when we watched a portion of a local television interview with Dr. Edgar Epperly, the foremost authority on the famous unsolved crime. Five years passed before we contacted Ed and embarked on an incredible journey lasting more than a decade and resulting in a feature-length, critically-acclaimed, and award-winning historical documentary feature film exploring America's greatest unsolved mystery. 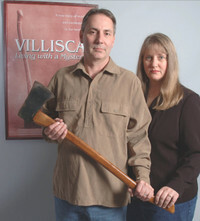 "Villisca: Living with a Mystery" has since been featured in numerous film festivals, screened in theaters in nearly 60 cities, qualified for the Academy Awards competition in the documentary feature category, was released nationally on DVD, and recently aired on public television with more broadcasts to follow in the coming months. Epperly has now researched this singular event in American history for over 50 years and our time “on-the-case” has now stretched to 15 years. Several books about the murders have been published and more are in the works (including our own!). New information and perspectives come to light almost weekly in this fascinating and enduring murder mystery.